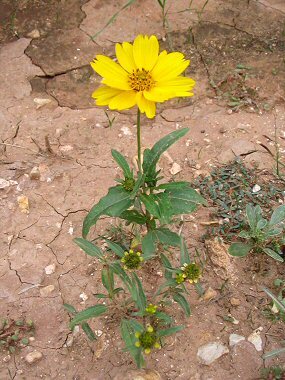 Golden Crownbeard is a member of the Sunflower Family. It grows to 3 feet in height and has grayish green, triangular leaves with toothed edges which grow to 4 inches in length. The plant typically grows along roadsides and in washes at elevations below 7000 feet. Native Americans and early settlers used the plant to treat skin diseases, boils and spider bites. Golden Crownbeard typically blooms between March - December and produces a bright yellow flower, each lobe of which contains 2 notches, to 2 inches in width. The seed of the plant is covered with grayish brown hairs which gives rise to its name.